THE Dream Quilter™ 15 was crafted with all of the high-end long-arm features you desire in a truly affordable quilting machine. The extended work space gives you the freedom to quilt larger patterns or blocks. This machine boasts superior stitching with built-in stitch regulation, and four types of stitch modes to choose from. We are extremely excited to introduce to you THE Dream Quilter™ 15, a 15″ Mid-Arm Quilting Machine, crafted with all of the high-end long-arm features you have come to love in a truly affordable quilting machine. Many major functions and settings can be controlled right from the Brother exclusive custom grip handles and can be easily navigated through the full color 5” LCD touch screen display. This machine boasts superior stitching with built-in stitch regulation, and four types of stitch modes to choose from. The extended 15″ throat gives you the freedom to quilt larger patterns or blocks. Features such as the large M-class bobbin, automatic bobbin winder, laser stylus and the Brother exclusive custom grip handles with rotating capabilities that allow for more control closer to the fabric make quilting a breeze! The Brother Dream Quilter 15 DQLT15 Mid Quilting Machine is compatible with several models of Grace quilting frames as well as it has its own quilting frame available. download our free PDF brochure on both THE Dream Quilter™ 15 and THE Dream Motion™ Quilt Automation Software. Brother Built In Bobbin Winder on DQLT15 Dream Quilter. Watch Lisa Rodgers demonstrate how easy & convenient it is to wind a bobbin on THE Dream Quilter 15™ DQLT15. THE Dream Quilter™ 15 l Adjusting Thread Tension. Watch Lisa Rodgers demonstrate how easy & convenient it is to Adjust Thread Tension on THE Dream Quilter 15™ DQLT15. THE Dream Quilter™ 15, Installing The Encoders. Watch Lisa Rodgers demonstrate how to place the encoders on THE Dream Quilter™ 15 machine by Brother. 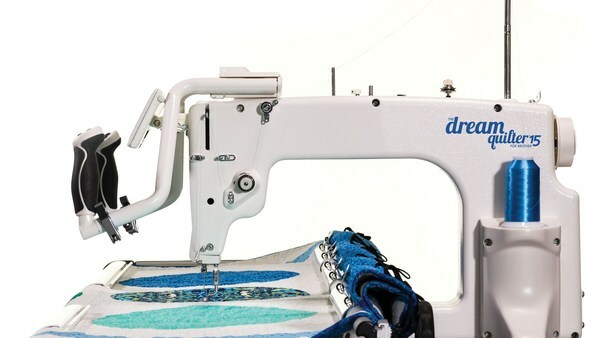 THE Dream Quilter™ 15 is designed to fit perfectly on THE Dream Fabric Frame. As you may know, THE Dream Fabric Frame not only gives its users an expanded workspace for zone to zone management, but it also fits easily into a 3’ x 5’ space. You can quilt small items including place mats and table runners to large items including queen and king size quilts. What more could you Dream of? 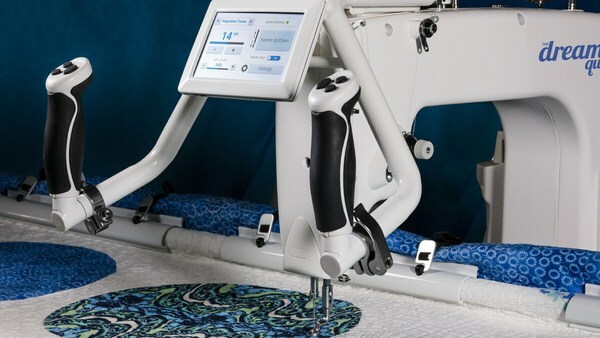 Learn more about the included features of THE Dream Quilter™ 15: 15″ W x 8″ H workspace, Up to 1,800 stitches per minute, 5” LCD touch screen display, Machine includes a free motion quilting foot and 10 quilting machine needles, Built-in stitch regulator, Dual-cone thread holders, Built-in bobbin winder, Large M-class bobbins, Laser stylus, Custom grip handles with 6-quick access buttons Handles rotate for more control closer to the fabric surfaces. 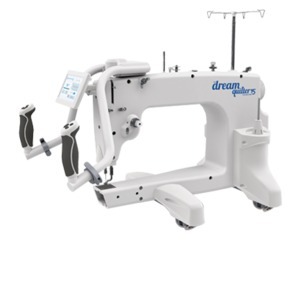 Comments: I am a new quilter to Long Arm quilting concept so I purchased the Brother Dream Quilter 15 but I am having difficulty with trying to figure out the different stitching modes on the monitor. The owners manual does not go into specific details on how to set the modes up and so I was frustrated and started looking on the AllBrand's website to see if I could find a video to assist me since I purchased the machine and table from the store. Unfortunately I had very little luck in locating a video to assist me until my husband went to the Grace Company website and he found a video on the Q'nique quilting machine which helped me understand how to set the different stitching modes. I think, as a new quilter, a DVD disk placed in the box with the machine with a tutorial on it to show the steps to set up the different modes would be of a great help and cause a lot less frustration for a new machine owner. Gwen in your Clear Lake store is a true gem! She is always so helpful and answers my questions. She is the reason I shop there. Thanks. What Qnique or Brother longarm quilting machine will you be using? What Grace or Brother quilting frame will you be installing the robotics hardware on?